And, Professional hosting ($99/monthly) is free until 1 October 2016. Use the code SPECIAL16 during checkout to get US$600 off your Pro Camera purchase. Offer valid through September 5, 2016. 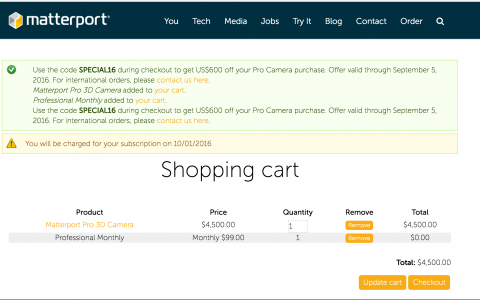 Matterport Pro 3D Camera added to your cart. Professional Monthly added to your cart.